The FBI released its March 2019 background check data. Both the headline and adjusted data show a double-digit year-over-year decline. Yet, firearms stocks bounced upon the release based on month-over-month increase. We take a deep dive into the data and see how it impacts Ruger, American Outdoor Brands, and Vista Outdoor investors. Without a doubt, the last few years of firearms and ammunition sales have been a rude awakening for firearms investors and analysts, even though not a surprise for gun owners. The slowdown has since been dubbed the "Trump Slump." After 2 years of declines, investors were thus optimistic when the January background check data showed a slight increase. There was hope that perhaps the sales have found a bottom or some sort of new normal being established. Unfortunately, that increase was short lived as February data showed massive declines, possibly pointing to some pulled up demand due to earlier product introductions and discounts in Q4 2018 and January. If you have not done so already, please take a look at "NICS, February 2019: That Was Brutal." March has generally been a good month for sales, and this year, there was a new potential fear catalyst, the terrorist attack in New Zealand, and the immediate ban on firearms. We covered this topic in my article, "A New Fear To Drive Firearms And Ammunition Sales?" Did it end up in the data? Now that we have the actual March data, let's take a look. For March 2019, the FBI Reported a total of 2,644,851 background checks. This is the HEADLINE number, which is generally reported and discussed by the media. As you should know, this number is greatly exaggerated for the purposes of likely gun sales as it includes administrative background checks as well. The headline number is down 122,848 checks, or 4.43% from 2,767,699 in March 2018. Looking at the adjusted data, the FBI reported 727,226 handgun checks. This is down from 781,452 handgun checks in 2018, a decrease of 54,226 checks or 6.94%. This makes it the lowest number of handgun checks since 2015. Long gun checks were the weaker data point this month. 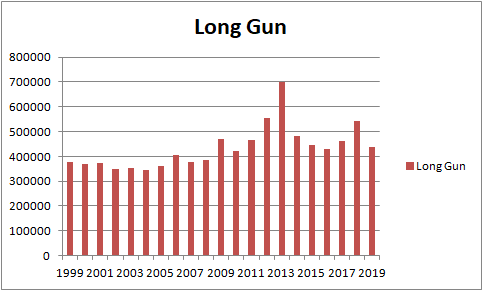 For March 2019, long gun checks decreased to 435,698 from 540,979 a year earlier, a decrease of 105,281 or 19.4%. This is the second lowest since 2011. We do have to keep in mind that February and March 2018 were abnormal due to the Parkland, Florida, shooting. As a result, we have 2 months of near 20% year-over-year declines for long guns so far in 2019. Combined, March 2019 saw 1,237,852 background checks adjusted by my methodology. This is down 179,661 checks, or 12.67% from a year ago. On the surface, the data must certainly look bad, and yes, without a doubt, there was a year-over-year double-digit drop in comparables. But this is where I think we have to look at "GAAP" vs. "Non-GAAP" numbers. As we know, early 2018 was atypical as we had a senseless tragedy. 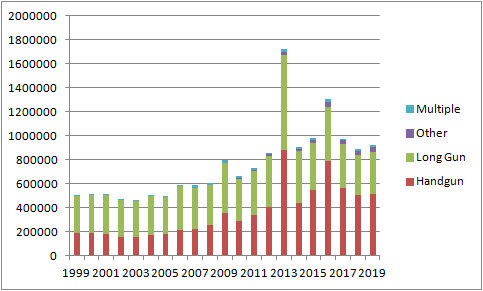 Of course, I do have to highlight that 2018 was not a typical year for February NICS data, as we did see the influence of the Florida school shooting. As we know, historically there is a proven cycle of increased gun sale after such events. Generally, it stems from a horrible event causing public outrage, which in turns gets politicians making calls to action. By the time the media news cycle moves on, a few weeks later, concerned gun owners go out and purchase new firearms as "insurance," in case new gun control measures are passed. This is also a major reason the compounded growth rate in firearms under a Democrat president has been more than twice as high as under a Republican president, as we've discussed in previous articles. Last year, the February data was impacted by the school shooting which would of course imply that barring any events, the February 2019 data would show a large y/y drop. While that is true, we do have to consider that ever since 2012, the responses to such events have been smaller and smaller. Source: "NICS, February 2019: That Was Brutal"
If we normalize for 2018, while the March 2019 data is still down, the data is not as bad. 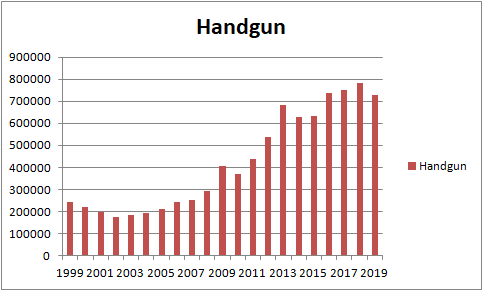 While handgun numbers have rolled over, they are only at 4-year lows. 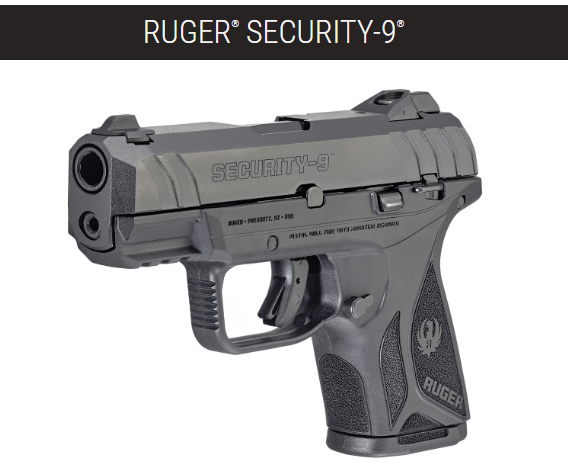 I do believe the strong product introductions from Glock and Walther have helped at the mid to higher price points, while the very competitive prices from Ruger and Smith & Wesson on firearms such as Ruger Security 9 and Smith & Wesson Shield and Compacts are giving gun owners access to truly solid firearms at very, very, very reasonable prices. Interestingly, in light of the declining year-over-year numbers, gun stocks enjoyed a very nice two-day rally. One of the justifications provided was that background check data rose over February. While that is absolutely true, that is also consistently the norm. Generally, we do have a rise from January through March, followed by a decline from April through the summer until the fall. 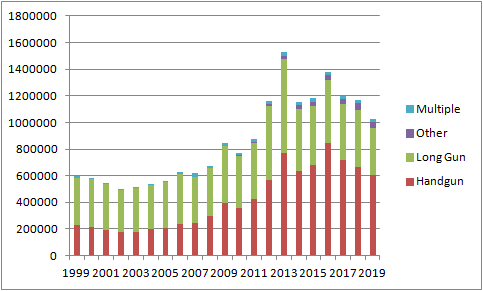 Below is the yearly adjusted NICS data for January, February, and March. Excluding the 2016 peak, the average adjusted number for the last 6 years is 938,680 checks. Excluding the 2016 peak, the average adjusted number for the last 6 years is 1,145,618 checks. We even left last year's number as the response to Parkland, FL. Excluding the 2018 peak, the average adjusted number for the last 6 years is 1,203,359 checks. In order to get a cleaner average, I excluded last year's data. As we can see, there is a completely normal rise in background checks that occur into March. In my opinion, it was not new demand, or stronger sales. It was simply normal seasonality. In March we saw the normal annual increase in gun and suppressor sales volume that we've come to expect due to customers' receipt of tax refunds. - Todd Moyer, Freedom Sports LLC. The slowest time of the year is definitely after the Christmas holidays until mid March, when people receive their tax refunds and the weather turns more pleasant for outdoor shooting. It is then pretty steady throughout the summer with another spike in volume for fall hunting seasons along with the Christmas holidays. The first quarter of 2019 has surely been a head-scratcher. January brought a positive surprise, while February served as a rude awakening. Yet, March, while still down year over year, was not that bad all things considered. Generally, March is the strongest month in the first half of the year as buyers are glad to invest some of their tax refunds into firearms. For investors, there is nothing in this release that would make me consider changing any investment decisions. Investors and analysts will have to wait until April and May to start seeing any continued year-over-year trends. One driver that we may have in those numbers, however, is the annual NRA Show. While smaller than the industry's largest trade show, the NSSF Shot Show, I expect firearms companies to introduce new products at the NRA Show in the next few weeks. Another driver that I am excited to see play out is the California court decision that ruled the 10 round magazine limits unconstitutional. Firearms accessories dealers and manufacturers are quickly taking advantage of this and are sending A LOT of standard capacity magazines to the state. It will be interesting to see if this may have any impact on firearms sales. Perhaps, I am not the only person who buys magazines for firearms they do not yet have. What Does March Mean For Investors? For Vista Outdoor (VSTO) shareholders, the year-over-year drop due to Parkland will most definitely continue to have an impact on ammo sales. While Savage does not have a lot of sporting rifle exposure, the ammo supplied by Federal, Speer, American Eagle, and others is far bigger. 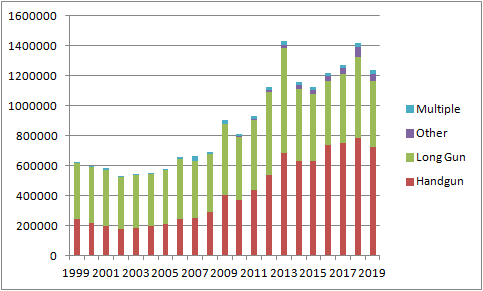 For American Outdoor Brands (AOBC) shareholders, there is surely questions about the comparable year-over-year sales for rifles, particularly AR-15s. As we know, most gun control agendas are focused on AR-15s and they are a larger percentage for Smith & Wesson versus peers. For Sturm, Ruger & Company (RGR) investors, I believe there is far less concern as, while Ruger does sell modern sporting rifles, the company's most popular firearms are the 10/22 and other bolt action guns. Combined with new product introductions such as the Security 9 Compact, I do not see major concerns from the March 2018 to 2019 year-over-year drop. The group of investors who should be concerned, however, are those in retail companies such as Sportsman's Warehouse (SPWH) which sell all firearms and are not immune. This was also one of the reasons why the company lowered guidance for this upcoming quarter. As a retailer, I am sure they had some hard data they could base their guidance on before the NICS data could be released. Bottom line, yes, another big year-over-year decline, but perhaps, the slowdown is slowing. We will have to carefully look at the next few months to get a better sense of the firearms industry. I hope this was helpful and look forward to your comments!